The Dan River is a river of contrasts – even contradictions. But it also has similarities like the brook trout and striped bass. Both fish fight hard, but do not leap- and both are naturally occurring. The Dan River originates high along the eastern slopes of the Blue Ridge Mountains in Patrick County and flows easterly until it empties into 50,000-acre John H. Kerr Reservoir (Buggs Island Lake) near Clarksville, Virginia. The Dan River is a stream for all seasons and the choice of a variety of anglers. It’s hard to imagine while standing on the banks of John. H. Kerr Reservoir that four counties to the west, the Dan River is a sparkling mountain stream and home to the native brook trout. The upper Dan lends itself to the wading angler, but the public access on the lower Dan River is generally best for those using johnboat and small motors. There are, however, two one-day float trips the canoeist can easily make – the first from Danville to Milton, and the second from South Boston to Aarons Creek. A ramp from hand-carried boats off Rt. 601 provides access to the lake created by this dam. Anglers can also hike below the dam to upper end of the six-mile stretch of special regulation stream with a 16-inch minimum, limit two fish per day. Fishing includes brook, brown and rainbow trout. The reservoir is reached via Rt. 602, where a ramp for hand-carried boats allows the angler downstream access to the “Grand Canyon” of Virginia, a six-mile stretch of rugged and spectacular scenery and fishing for naturally reproducing brown and rainbow trout. An angler can reach the mouth of the stream by crossing the lake in a boat or canoe. Or if he prefers he can fish the lake itself. Both the stream and the lake offer exciting angling possibilities. This ramp on the South side of the river is located just upstream from Schoolfield Dam and the Park Ave. bridge. It can be reached from Bus. Rt. 29. This access allows anglers with a boat and motor to run upstream, but downstream floats are blocked by a series of dams (including the one immediately below the ramp). There are also bank fishing opportunities. Fish species available to anglers at this site include black bass, sunfish, and catfish. Striped bass migrating from Kerr Reservoir cannot reach this location, due to the presence of downstream dams. The landing is reached by taking U.S. 58 east out of Danville and keeping eye out for River Point Road which is marked by a blue Water Pollution Control Plant sign. At the end of River Point Road, turn left and follow the blue signs. When you reach the river, the plant will be on your right, but turn left and you will see the access point just ahead. There will probably be some empty boat trailers in the parking lot. From this point downstream to Milton, the canoeist has a day float of 12 miles, and anglers will find this stretch productive for white bass, and white perch in early spring, followed by the striped bass run. Downstream from the Danville landing is a public access launching ramp owned by the North Carolina Wildlife Resources Commission which is open to Virginia anglers. The ramp is approximately four miles from U.S. 58 at the Rt. 62 bridge crossing. You can tell by the number of vehicles parked at the landing whether the white bass are running. This is the takeout point for the canoeist making the Danville to Milton, North Carolina trip. Hyco River empties into the Dan River about 12 miles downstream from South Boston. This VDGIF landing is easily accessible from Rt. 58. You can fish Hyco River for bass, crappie, white bass and sunfish. This landing, maintained by the U.S. Corps of Engineers, is located just downstream from Hyco and is easily accessible from Rt. 58. The canoeist floating from South Boston should hug the right bank and paddle past the confluence of the Dan and Hyco Rivers. Keep your eyes out for a bend in river to the left. At that point you’ll see a wide grassy landing field on the bank and a rock wall on your right. Paddle up Aarons Creek to the right, and if you will find it in a mile or so on the left. The state park maintains two launching ramps which are accessed from Rt. 344. One is located on the north side of the Dan River and the other is located at the confluence with the Roanoke River. Beginning in the mountainous Patrick County, the Dan River begins north of U.S. Highway 58 and slightly northeast of the Meadows of Dan. In this section of the river you will find fishing for native brook trout in waters classified as wild trout waters by the Virginia Department of Game and Inland Fisheries. Just above and below U. S. Highway 58 the river is a put-and-take trout stream – Category B. Traveling farther east, the river flows through a deep gorge within the Pinnacles Hydroelectric Project owned by the City of Danville. This area has been dubbed the Grand Canyon of Virginia, rugged and spectacular country that appeals to the hardy. It is in this area that the trout fishing becomes first class for rainbow and brown trout in the six-mile section between Talbott Dam and Townes Reservoir. The stream from Townes Dam to the Pinnacles Powerhouse has been designated as catch-and-release trout water. The Dan River from the powerhouse several miles downstream (Kibler Valley) is a popular Category A put-and-take trout stream. For more information on access and trout fishing the Dan River see the Trout Fishing tab (brand new) on this page. 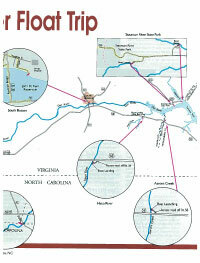 The trout fishing eventually fades as the river passes under Route 103 and flows into North Carolina. The river flows back into Virginia a few miles west of Danville, Virginia as a slow flowing Southside Virginia stream. Fishing is generally limited to catfish, largemouth bass, and several kinds of sunfish. The only boat access is found just off of U. S. Highway 29 (Memorial Drive) at Dan River Park on the south side of the river just upstream from the Primary Route 51 Bridge. Boats launched here can go upstream, but are blocked from downstream by a series of dams within the city limits. There is some bank fishing for catfish, bass and sunfish in the city stretch of the river. The landlocked striped bass fishing the Dan is noted for begins east of the city with the city of Danville access point and launching ramp just downstream from the Water Pollution Control Plant. This ramp was built as a joint effort between the Dan River Anglers Association and the city of Danville. 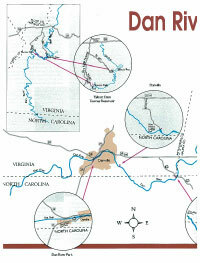 The river flows back into North Carolina for approximately five miles before re-entering Virginia. Thanks to a reciprocal agreement, anglers can fish in North Carolina and Virginia from the Brantley Steam Plant Dam downstream to and throughout J. H. Kerr Reservoir. They can also use the North Carolina Wildlife Resources Commission access point and ramp just off of Primary Route 62 near Milton, NC. Downstream, Department of Game and Inland Fisheries ramps at South Boston, Hyco and Staunton River State Park offer access to the river. Access is also possible at an undeveloped access area at Aarons Creek. Typically, anglers fishing the lower reaches of the Dan do not float from one launching ramp to another, but using outboard motors fish up or downstream from the access point, putting in and taking out at the same ramp. Migratory fish running out of J. H. Kerr Reservoir (Buggs Island Lake) and flathead and blue catfish are the heart of the lower Dan River fishing. Walleye begin moving as early as January, and the white perch and white bass begin to migrate when the dogwoods bloom in early April. The most popular is the striped bass run that begins in late April and continues through May. There is also some winter fishing for walleyes. Few rivers offer a wider variety of angling opportunities than the Dan. For more fishing information see narrative for sections under Maps. Dan River (Patrick County) – Catch and Release section between the Pinnacles Powerhouse and Townes Dam. Dan River (Patrick County) – Trophy Trout water between Townes Reservoir and Talbott Dam. See Maps section for fishing trips. For More Information, please contact the Forest Office.